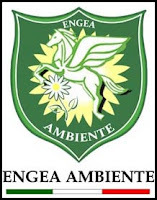 ENGEA is a huge national Italian agency which coordinates many equestrian activities along with offering training courses for the licensing of horseback trekking guides and riding instructors. Their membership includes 3,000 licensed guides and instructors along with over 30,000 regular members who are involved with horseback riding and other equestrian activities. Mauro Testarella, the president of ENGEA, recently announced that ENGEA has officially adopted the Dabney Gentle Horsemanship training program as the authorized method of handling, training and riding horses. Sponsored by ENGEA, Ed will be conducting numerous horsemanship and riding clinics throughout Italy to introduce the Six Keys to Harmony program and immerse ENGEA members in Gentle Horsemanship training. "I am deeply honored that ENGEA has chosen Dabney Gentle Horsemanship to conduct their upper level training program. I am sincerely grateful for the confidence President Testarella has shown in me and our training methods. I am certainly looking forward to a long and productive association with ENGEA." 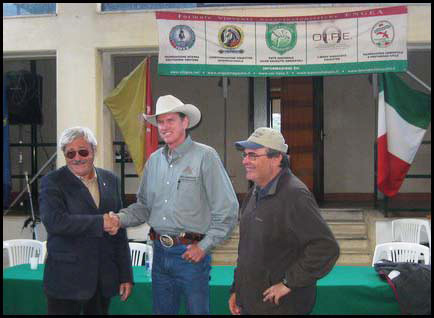 After the conclusion of the first two ENGEA sponsored Dabney Gentle Horsemanship clinics in Italy in June, President Testarella awarded Ed with the highest Five Star level Certification of ENGEA Superior Instructor "ad honorem". This is quite an esteemed honor as there are only a few instructors in all of Italy who hold the Five Star Certification.